Has it been almost a week since I last posted? It has! There is so much going on. Post-Sandy, I'm back at work but our offices are not 100% yet. My boss lost her home and much more than that, so she's gone for now. Additionally, New Jersey's Courts in the north of the State are still closed or just now beginning to open -- at this point I'm basically catching up on a little paperwork and getting ready for the avalanche of work once everything reopens. But there are other reasons! On the bright side, our family welcomed a new addition, my middle brother's third daughter. Natalia A. J. arrived on November 3rd and weighed 8.5 lbs. She arrived just in time to bring happiness and much needed brightness to all of us! I'm a tia again! What about reading? 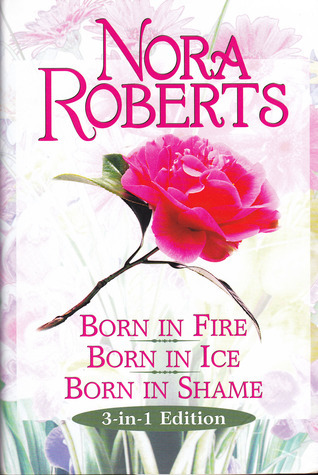 Well, during the hurricane I was unable to read new books, so I picked up an old favorite comfort re-read, the Born In Trilogy (1994 to 1996) by Nora Roberts (Born in Fire, Born in Ice, Born in Shame). Why do I love this trilogy? Well, Roberts has a way with her depiction of those small little rural places in Ireland. In this case it's County Clare with its farming land, the village, pub, and all the requisite places: castle ruins, cliffs, and the sea. But of course Roberts' characters, from the protagonists to the villagers, are the main attraction. There is spitfire Maggie and her jackeen Rogan, cool-as-a-cucumber Brie and her charming Yank Grayson, and of course beautiful-oh-my-god-I-have-a-crush-on-him Murphy Muldoon and clueless-somebody-smack-her Shannon. I've read and re-read this trilogy countless times and know these books like the back of my hand. I still love them! My favorite hands down? Although Born in Fire IS fiery and Born in Shame has my favorite Irish hunk Murphy Muldoon as its hero, for me Born in Ice is the most romantic of the three books and the one I read slowwwly this time around. It took me forever to finish it because I wanted to savor every word. Have you read this trilogy by Nora Roberts? It's a classic and it is still my #1 favorite trilogy by this author. I also read Conor's Way by Laura Lee Guhrke. I loved, loved this historical romance! Truthfully? I enjoyed this book from beginning to end. I looked at this book critically (as a reviewer), and if you review books, you know there are always flaws to find or nit picking to do. But, sigh... as a reader, there just was not one aspect of this book that I did not enjoy! From Conor and Olivia as our main romantic couple, to Olivia's three little girls who play their roles as secondary characters to perfection, the characters are fantastic. I love the mixed setting -- the small town in post-revolutionary American South in the present, and a famine-plagued/post-famine Ireland full of revolutionary Fenians in Conor's past. This was an emotionally wrenching story with a tortured hero, but it was also sweet, sweet, sweet, with a great strong spinster heroine and three little girls that will win your heart. Lovely! This week I also picked up and finished Velvet by Xavier Axelson. A gay historical romance, this is Axelson's first full-length novel. I will be reviewing it soon. Last, but not least, today is National Election Day in the U.S., it comes every four years and doesn't take too much of our personal time. So, please don't forget to vote! I think I have Nora's Born In trilogy from Mariana, so I will pick them up when I am in the mood for some comfort reading. So happy you loved Conor's Way, too. I voted this morning.. saw some people in my neighborhood who are still without power and their houses were 49 degrees this morning. :(( Still worse for so many who lost EVERYTHING. Heartbreaking. Still waiting to hear if power has been restored to the schools in town. The kids haven't been in school since OCT 26! Christine, I will pass it along to my brother and SIL. My brother's oldest daughter is 23, the second one is 9, and now... bahhh boom! BABY girl Natalia!!! *g* We are excited... I didn't think I was getting another niece/nephew -- so this might be our youngest one. It's a happy moment for us. Conor's Way was wonderful, Christine. I just enjoyed it so much that I'm having a bit of a problem picking up something else that pleases me at the moment. I loved all the characters in that book. :) All the ladies in the TBR Challenge who reviewed it and loved it were absolutely right! (I forgot to mention that on my post!). My neighborhood got up to 100% with power as of last night! But, Courts and schools are still closed. All our court dates have been adjourned, and our deadlines are in limbo at the moment so you can imagine that the calendar is going to be a doozy when everything resumes. The legal system is on hold! Schools should open tomorrow, but now with the Nor'easter and snow coming to our area tomorrow we're not sure if they will open. Everyone is so nervous and skittish about it! PS: You MUST read the Born In Trilogy! 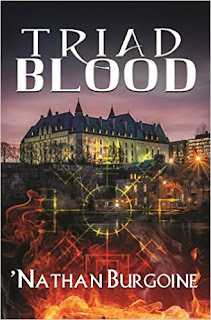 It is wonderful because of the romances, but there's more to it... there's the atmosphere and signature NR descriptions in these books that I just love, plus that wonderful sense of family and community that everyone always mentions when they describe this author's books. So, read it! LOL! I have never read that Born in trilogy from Roberts but you made me want to pick it up. Congratulation Auntie Hils! All the best to your brother and his growing family. I hope Mommie and Natalia are doing well. The devastation in NJ and NYC is incredible. I'm sorry to hear about your boss, so many folks lost everything. We finally managed to reach my family in NJ and NYC when their power returned on Sunday. Some damage to their homes, but nothing that isn't fixable. It's a great relief to finally know that they're OK. I hope all goes well with the election tonight. The news outlets here in Canada are reporting that it'll be a very close vote (hope it's not a repeat of the 2000 election). I'm watching CNN at the moment and am getting nervous with the early returns. I think you know who my candidate of choice is. It'll be a nail biter. Indie, thank you! Natalia and Elizabeth are home and doing fine. We are all ecstatic over this little girl! I am SO glad that you finally heard from your family in NJ and NYC, and that they are all fine! Waiting to hear news can be excruciating -- we always think the worst. Nath, there are tons of new pictures! I have to post some on Facebook. :) And yes, my poor boss has had a troublesome year, 2013 can't come soon enough for her.